St. Basil Church wishes you a blessed Feast of the Nativity of our Lord, God, and Savior Jesus Christ, who has manifested to us the mystery of God’s humility and love. Please read the annual Nativity message by Pope Tawadros II here. Thank you to each and everyone who participated in the Donation Matching Challenge - we are grateful and overwhelmed by your generosity. 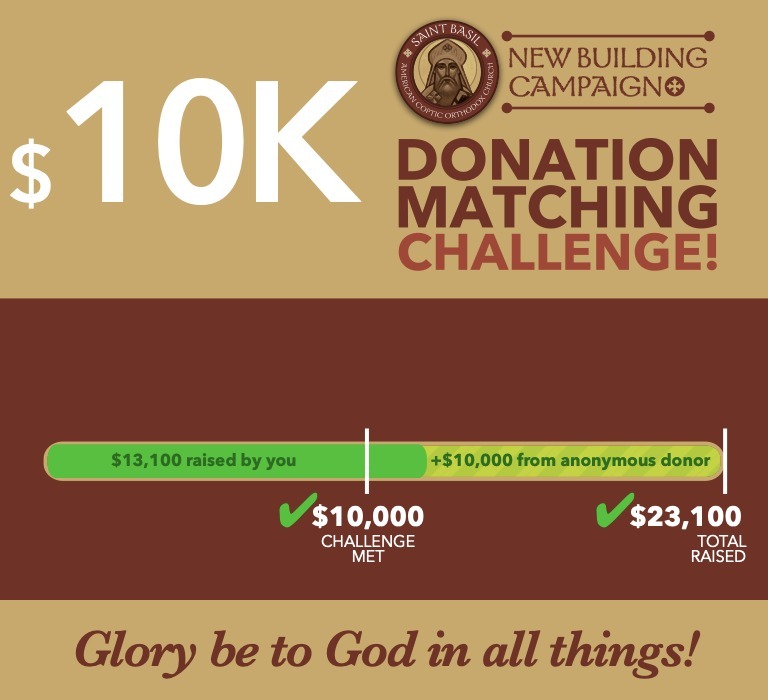 You not only matched the amount by the anonymous donor, but you exceeded it. We were able to raise a total amount of $23,100! To those who would still like to donate, look out for a new challenge in the near future. In the meantime, you can always donate on our website. Father Kyrillos Ibrahim announced that His Eminence Metropolitan Serapion has selected Ehab Maximous as worth of ordination to priesthood and his intention is for St. Basil to be his future parish. Let us congratulate Ehab, his wife Mariana, and his children Grace, Mark and Luke.